Identifying a piece of glass as white used to be the best way to categorize milk glass. However, not all white glass is milk glass. The term now applies to colors with an underlying milky or opalescent presence. Milky blues and shell pinks fall under the category "milk glass." Earlier milk glass achieved white through the addition of tin oxide or fluoride. The "American Sweetheart" pattern and names like "Vitrock" and "Monax" are regular white glass. Learn to tell the difference between the two. Learn to distinguish between milk glass and white glass before you begin to buy pieces for a collection. Find books and venture online to look at pieces and compare them. There are few differences between regular white glass and milk glass; identification may be difficult. 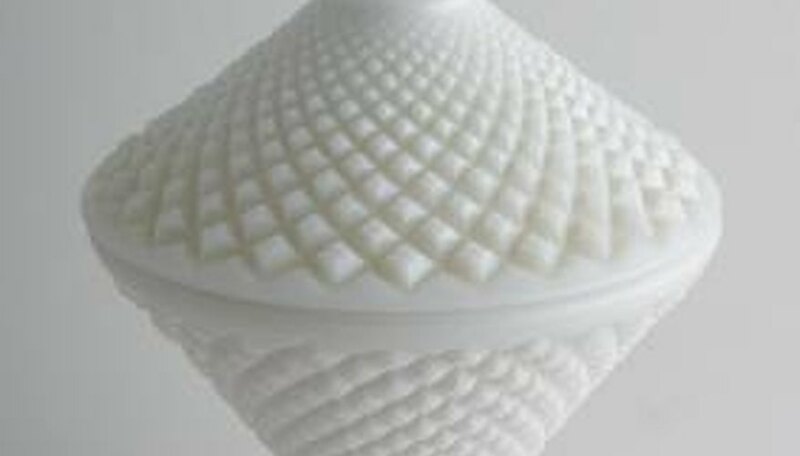 Milk glass is outwardly decorative, whimsical and detailed. It could be encrusted with embossed motifs and/or painted enamels. White glass is less showy. It is more utilitarian with simple adornment, if any. Study the white glass of "American Sweetheart Monax," a pattern produced by MacBeth-Evans Glass Company. Originally used for light fixtures, Monax is a thin, translucent white glass that was machine-pressed into molds. Despite its delicate appearance, it is durable. The pattern around the rim retains a translucent pale blue tint. If you hold the piece to the light, it will appear opalescent. A machine-pressed motif of scrolls and curlicues are inserted between a scalloped design along its wide rim. Now look at the milk glass used in Westmoreland's "Flared Sawtooth" or "Old Quilt." Both replicate glass crystal with sharp-tooth, jagged rims or raised checkerboard motif. Considered elegant glassware, it is highly decorative, clunky and more detailed. These milk glass patterns are robust in appearance and showier. Look for the familiar markings of "W" superimposed with a "G." Pieces may have slight ripples along the surface, known as "straw marks." This is not a flaw, but it is a characteristic of the molded glass. Examine the Fire King White or "vitrock" ware. This is a white, heat-resistant glass ovenware and restaurant ware that is functional. It is more opaque and creamy when compared to the less-shiny "Monax," but it is more translucent than milk glass. It has a soft, glossy sheen. It's also easily recognized with its Art Deco influence, scroll work or raised shell pattern. There will also be decals or decorative edges to help you identify the piece. Markings include the words "Fire King" in script, or its anchor trademark and/or the words "heat proof" or "oven proof." You'll see that Fenton's milk glass is molded. Patterns include its Silver Crest line with translucent ruffled edges or bold hobnailed (raised bumps) patterns, among others. Pieces are solid and heavy, both visually and physically. Look for mold marks or slight roughness along its sides. Pieces are uniform and balanced, sculptured. Handled items retain the personal stamped mark. Milk glass items produced after 1958 will be more opaque. The word "Fenton" is written inside an oval shape on newer pieces. Find Hazel Atlas Glass Company's limited production of "Newport Platonite White." This brilliant white, opaque tableware is similar to milk glass. This tableware features a series of light ribbing or wide Vs, impressed around the rim. It is often referred to as "hairpin." Pieces were in Platonite white or with fired-on colors with white as an underlay or base. This white glass is modest in design and usually marked on the bottom with the "H" over "A." Notice the differences between the Newport Platonite White and the popular Fostoria "American" pattern, initially produced in crystal. Notice that this milk glass is heavier and thicker. It has a raised cube pattern in uniform white that is flawless. More polished and glossier than other milk glass, Fostoria produced a limited quantity. Fostoria followed other glass companies in producing something similar to porcelain china for a reasonable price. Most American pieces have 3 mold seams. The easiest white ware to identify is probably Pyrex Corning's Opal White series. This solid white tableware goes "from freezer to stovetop." It is thick and heavy. Unlike milk glass, it is heat-resistant. You can easily pick out Pyrex for its simplicity and practical bakeware. Design, if any, is minimal. Earlier pieces include white glass dual-purpose mugs/ hand warmers made for soldiers during war time. Markings include the Corning "horn blower" mark. Other markings are embossed with "Pyrex" and "Made in U.S.A.," a pattern number or date of production. Recognize markings/hallmarks by glass manufacturers. Know terminology before collecting glassware or tableware. Know before venturing to flea markets, garage sales and auctions what the value of certain pieces are worth. Visit glass exhibits and museums. Purchase milk glass and white glass from certified dealers and collectors.